Jeff Sessions has just resigned and Matthew Whitaker will become the acting Attorney General. We are pleased to announce that Matthew G. Whitaker, Chief of Staff to Attorney General Jeff Sessions at the Department of Justice, will become our new Acting Attorney General of the United States. 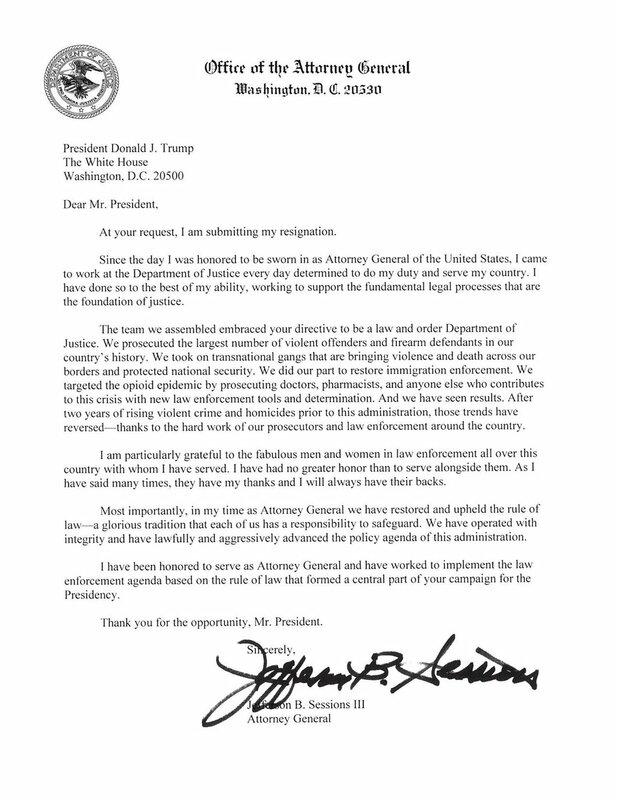 He will serve our Country well……..We thank Attorney General Jeff Sessions for his service, and wish him well! A permanent replacement will be nominated at a later date. According to Fox News, Trump asked Sessions for his resignation before he went out to speak at the press conference. Acting AG Matthew Whitaker will now be in ultimate charge of the Russia investigation, according to a doj official. Most big cases flow through DAG's office first and it's unclear how this will all be sorted out. Jeff Sessions had recused himself from oversight of the Russia probe, punting it down to Deputy AG Rod Rosenstein. As Acting AG, Whitaker has no such recusal and so is now in charge of overseeing Mueller, per NBC News.